Dr. Amy Cao graduated from the University of Sydney Faculty of Dentistry in Australia, earning the Rudolf Gunz Medal award for proficiency in knowledge and clinical work in all aspects of her final year. She also completed her undergraduate degree at the University of Western Ontario with an honours double major in Biology and Medical Sciences. 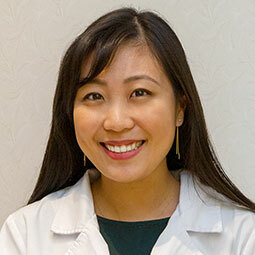 Dr. Cao is committed to providing patient-centered care, and has experience working in general dentistry, pediatrics, aged care, and emergency treatment. She believes that creating a friendly and comfortable environment is just as important as delivering exceptional dental services for each and every patient. After living in Sydney, Australia for a number of years, Dr. Cao is excited to be back in the Kitchener-Waterloo region where she grew up. Outside of dentistry, she enjoys spending time with family and friends, hiking, and exploring new cafes in search of a good cup of coffee!